Being the 25th of January, and especially as one of our nearest pubs is Adelaide’s Scottish pub, the Rob Roy Hotel, it would have been remiss of us, if not downright unpatriotic, not to have celebrated the Bard (Robert Burns) in the traditional way. Traditions remain, but customs change; so instead of the usual bagpipes, kilts and highland flings (a dance, not a romance), the Rob Roy was offering an upmarket Scottish degustation menu with a matching single malt Scotch whisky for each course. Are traditions forever, or should they develop over time? We skipped the formal sitting in favour of the bar version offered daily as part of the pub’s Robert Burns Week (good to see the expansion of the Bard’s influence). Three courses included the obligatory HNT – haggis (a kind of offal pudding- ghastly to look at but delicious), neeps (controversially here, a mixture of diced swede and turnip – rather than mashed) and tatties (mashed potatoes) as the centre piece. 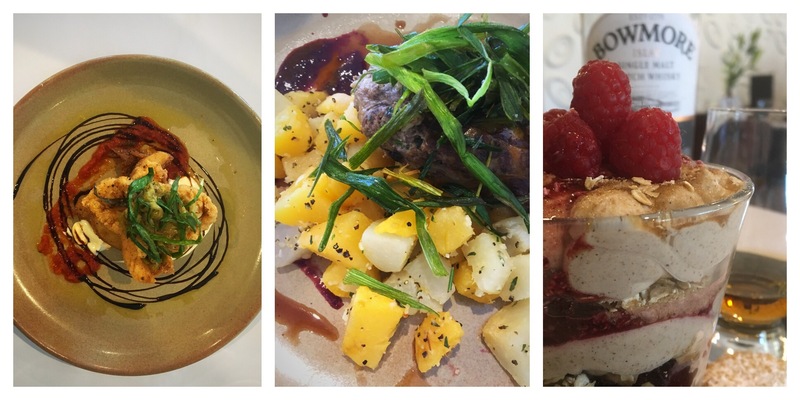 Either side of the main was a starter of crispy potato and chicken with caramelised leek, and the obligatory and incomparable sweet cranachan, served the style of a trifle with layers that got better and better ending with whisky infused blackberries and blueberries as a finale. Back at the bar, the whisky sommelier was performing quality control on the four drams he had lined up for the food, including my favourite: the Caribbean Cask Balvenie 14 (paired with the cranachan). It seems that whisky is following the path of gin, being appropriated by the hipster generation. 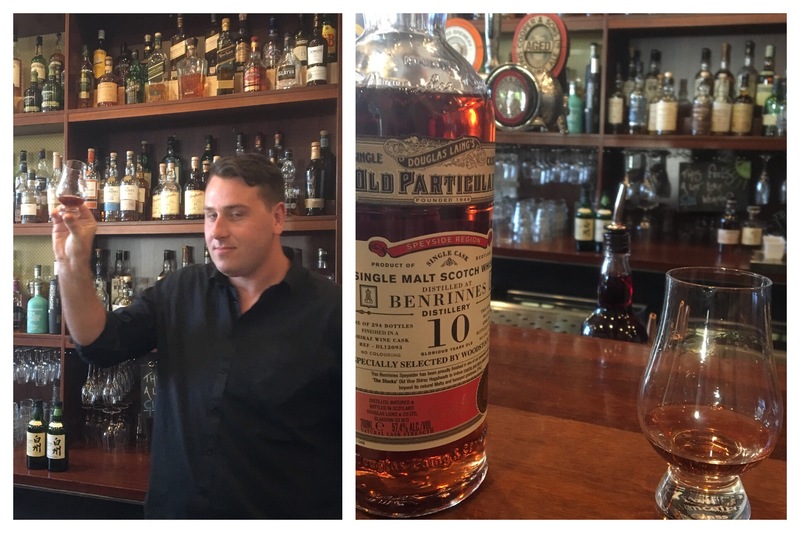 We met a young man who was spruiking a bottle of single malt which had been matured in McLaren Vale shiraz barrels (rather than the customary bourbon ones). This (pictured) was the only bottle of its kind in Australia. With true highland hospitality he offered me a taste; at cask strength (58%) the spirit had its fiery way- but you could tell there was good flavour underneath. Was it a good thing, the GF asked, that whisky is becoming the latest thing? Well yes, it’s great to see innovation and interest in whisky distilling, but where were the kilts? Are traditions forever, or should they develop over time- like the spirit in the barrel? Please share your thoughts below. Incidentally, as befits modern times, the title of this post was chosen by spelling auto-correct: just try typing “tattoos” into your phone. There it did it again! T-A-T-T-I-E-S.
For the Daily Post weekly photo challenge Variations on a theme. Looks and sounds really good food (and drink if whisky smell doesn’t make you almost queasy) but seems to have been reason to have posh meal rather than a Burns night? Poetry, kilts and bagpipes would have to be present for me to be calling it a Burns night. Mind you can count on one hand the number of times in lifetime, home Burns nights are haggis, mashed needs and tatties and no I’ve never had a kilt!